Looking for a cute print craft for Mother's Day or Father's Day? 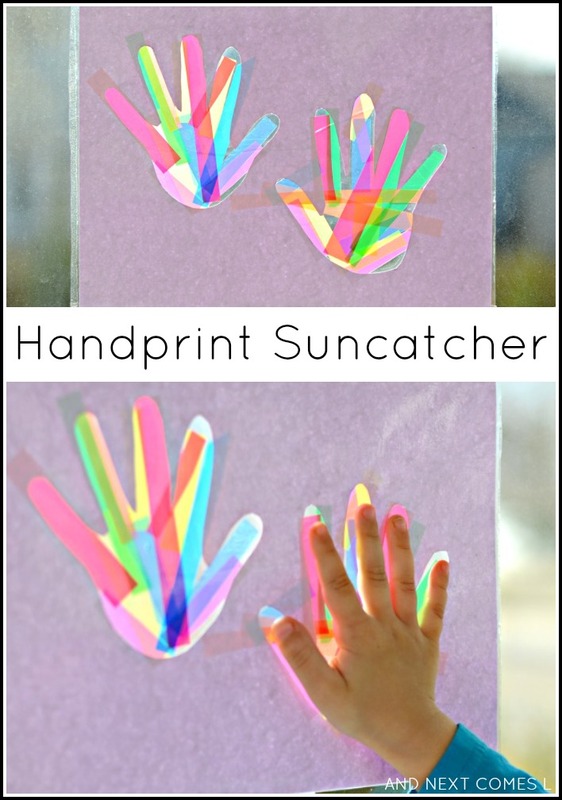 Well, look no further than this colorful handprint suncatcher craft! It has been proudly displayed in our sunroom for over a week and I absolutely love how it turned out. It's so bright and cheerful and it was really easy to make too! I love that it requires no glue, encourages fine motor skills, and even provides an opportunity to explore color mixing. Three year old K really enjoyed making this suncatcher. I will definitely have to get J to make one too. Very nice. Off to get some tissue paper tomorrow ready for Grandad day. I am sure my 3 year old (nearly 4!) granddaughter will love making this for mum.